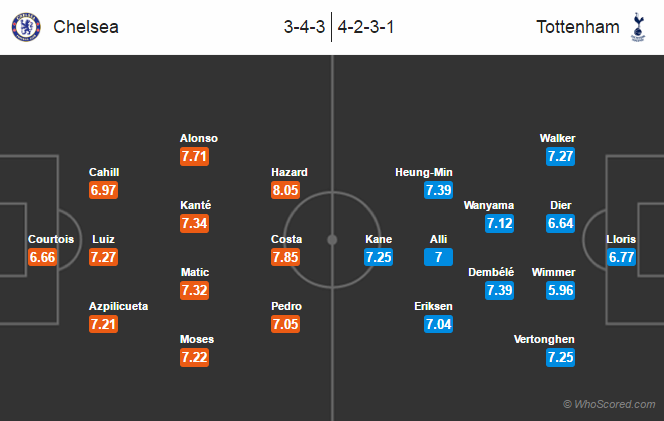 Possible Lineups, Team News, Stats – Chelsea vs Tottenham Hotspur. Premier League match preview. Referee: Michael Oliver, Stream Guide: Watch Live. Duo defenders Kurt Zouma and Marco van Ginkel are still out through fitness issues. Skipper John Terry is also out with another injury for further two weeks. Boss Antonio Conte is expected to start with a similar lineup as of last weekend. Manager Mauricio Pochettino remains without few names, Erik Lamela, Toby Alderweireld and Ben Davies, all out through injury. Danny Rose is suspended after being booked for five times. Jan Vertonghen is expected to take his left-back role. Youngster Harry Winks could be getting a starting node. Chelsea have won their last six Premier League games, keeping clean sheets in all. Spurs have not won any of their last 20 away games against Chelsea. In the last six meeting between these two sides, Chelsea won three, Spurs won one, and two ended as draw. Chelsea have netted more than a goal in their last five home games against Spurs in all campaigns. Spurs have drawn their last three away Premier League games. Chelsea 1 – 1 Tottenham Hotspur, a tough and an entertaining game. Diego Costa to score the equalizer for the home side. Chelsea are in great form, the odds on Chelsea winning are already very high.